Scarlet Lotus Dance: Teaching a class with a drummer. Teaching a class with a drummer. 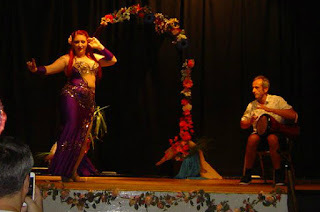 Anyone who attends my Glastonbury or Bridgwater bellydance classes, or indeed knows me from the local hafla circuit, will know that I often come as half of a double act. Doum Tekka plays darbuka/Egyptian tabla, we met at my first Glastonbury hafla in 2013 and he has been regularly playing in my classes for nearly 2 years. I know that not all teachers feel they can "use" a drummer in their class. When Doum Tekka first asked if he could play in class I wasn't entirely sure how it would work. I knew a live drummer would be really helpful for teaching rhythm recognition, but it didn't make sense on a weekly basis. Or did it? New dancers often have issues recognising the downbeat in the music. With a live drummer you can either dance to a plain rhythm (and keep it as plain as you like) or ask them to play along with the rhythm in a recorded track. Either way, the beat comes through more clearly and students have told me they find it easier to co-ordinate their footfalls or keep the pace of a move. When I play recorded music, I usually talk to my class about the track, its origins, instrumentation, lyric meanings and rhythms. Again, with a drummer playing along with the rhythm, it's clearer and easier to recognise. Or I can ask for a quick demonstration of the rhythm then ask the class to listen out for it on the track. I knew from the start that a live drum would be useful for teaching rhythms, but this doesn't have to happen as an isolated lesson once a year or so, it can happen every lesson. Also, while a dance teacher should have a good working knowledge of Arabic rhythms, a drummer will always be better, that's their area of expertise! It's not just my dance students that learn more about rhythms from our resident drummer. I do too, all the time. It's great having someone really enthusiastic turning up every week with a new variation on a basic rhythm, or something daft like a 14/8 saying "hey check this out". If you are a dance teacher, no matter how organised you are with lesson plans and matching playlists, there will inevitably have been a time when you were desperately trying to find the right track for something. Maybe your students needed to go over something slower than you expected, or you were led down a new path and changed your plans at the last minute. No problem if you have live musicians. You can request the rhythm you want at exactly the speed you want, slow down, speed up, gradually accellerating, whatever you need. I know I am spoilt by having a live drummer in class because I always complain when I have to keep pausing or changing the music when he's not there. We've reached the point now where Doum Tekka will watch me break down a technique, work out what rhythm will work for it, and start playing to match my pace as we drill. It's like movement activated music and it is absolutely brilliant! A good drummer for dancing needs to have a whole host of skills other than the usual technique and musicality of a standalone musician. A good dance-drummer should be able to read a dancer, to recognise the need for a change of pace or rhythm, to maintain a subtle 2 way communication that makes for better performance and frees up improvisation. There aren't a lot of places for drummers to learn this. Mostly occasional workshops at dance festivals or hours of drum solo practice with a dancer. In class however, these skills develop organically. Start working with a drummer who knows their rhythms and gradually they will grow into a drum solo partner. Drumming for class is also excellent practice, extended periods of play, practising rhythms that might have been over looked and playing slowly with a focus on quality of sound and technique are all really worthwhile from the drummer's perspective. A good drum solo performance is not just about a good drummer and a good dancer being in sync with each other, it's also about chemistry. Dancing with a drummer you get on with, can share a joke with an suchlike makes a big difference to your performance. Seeing each other on a regular basis for class and a catch up fosters a good working relationship, as well as many short, incidental practice sessions. Being on good terms with the drummer also means it's easier to negotiate sets without worrying about offending them! Work with someone long enough and you will start to pick up their habits and idiosyncrasies. I can hear when Doum Tekka is winding up the end of the solo, he can see when I am, so we finish together. I also recognise when he likes to put the pops on top of his rolls so I can ornament them, or how he structures the ornamentation on the basic rhythms which allows me to acknowledge more of the music in my dance. None of this comes from conscious study, it's just familiarity. It comes from hours of practice and listening, which builds up quickly with a couple of classes a week and regular pre-class jams. Most of the time having a drummer in class is really useful. Teaching choreography is a possible exception. This might be more my own hang up because I feel guilty constantly interrupting the flow to repeatedly work over the same short sections. On the other hand, plain drums are a great intermediate step between dancing to a count and dancing with the actual music. The other potential issue, if your drummer is male, is breaking the "women only" space. This might be an issue if you teach Muslim women, who will not want to dance in the presence of a male, or if your class are very self conscious. That said, I have never had any feedback from students suggesting that they have an issue with a male musician in class, mostly they focus on their dancing and ignore him! My classes are open to all genders, and I don't consider a male drummer to be any different to a male dancer in class. They are there to work just like the rest of us. When I run the Red Goddess course, that is a feminine centric environment, and a fairly raw emotional one too, that is the only class where I personally would rule out the presence of any individual who was not an active participant in the primary course content. Dancers often tell me how lucky I am to be able to work with a drummer, but I have also met a lot of teachers who are very reluctant to allow a drummer into their class. My advice would be to give it a go, it's a fabulous learning experience and it could well open up a whole new aspect in your dance and teaching. Very interesting article - I would love to teach like this. Just need to find a drummer, which seems to be the hard bit! Thank you. And good luck with your quest to find a drummer! Remember though that they don't need to be a fully developed musician to start with, if they can hold a basic set of 4/5 rhythms reliably then they can develop in class as you go. When I started working with Doum Tekka he was technically very proficient at a number of rhythms and ornamentations, but had never played for a dancer or attempted to play a full drum solo. More established/experienced drummers are harder to come by, and are often harder to pin down and work with if you don't already have a working relationship!